Concorde Charisma III 900LS: Luxury unlimited, engineering excellence! Prepare to be amazed. 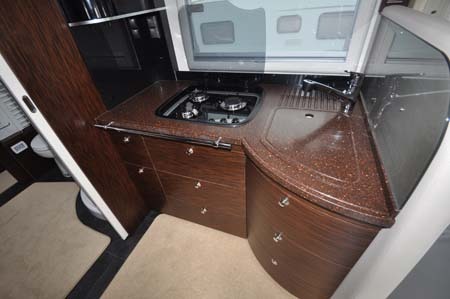 Even if you haven’t got a spare £160,000 or so to spend, you can only admire the sheer engineering that goes into a motorhome like this, literally from the chassis up. And it’s certainly exclusive. 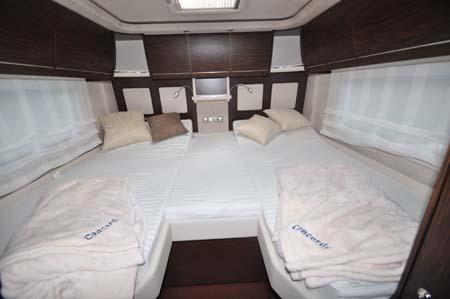 Germany’s Concorde expects to produce around 450 of its highly bespoke motorhomes in the year ahead. UK sales? Anything between 12 and 20 would be considered “the norm”. It really is almost luxury unlimited here, because the choice of options all but reaches infinity. This is very much a vehicle for you to specify to suit your specific needs. The example here is on a top-of-the-range MAN chassis, which makes it seem all the taller, especially as it’s not actually particularly wider. 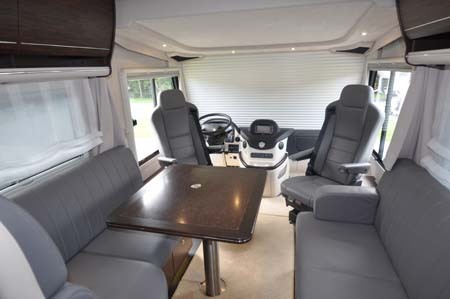 In reality, UK concessionaire Southdowns Motorhomes says it’s the Iveco platform that’s a more user-friendly base – and saves a bit of money! 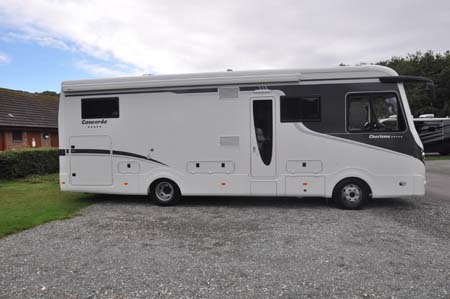 As here, and to give you some idea of the kind of vehicle we’re dealing with, the payload of the standard model is the same as the gross vehicle weight of a standard motorhome – 3,500kg! Just as important is what else is included in the bodywork all around you, because it really is an impressive package. They really do engineer their products at Concorde – adapting the chassis and altering aspects such as the front seats here: relocating them further forward to make more of the living space, and a bit further apart so you sit nearer the sides of the vehicle, as well as making the swivel operation all the easier. Also, that svelte, leather-clad dashboard is made by Concorde. 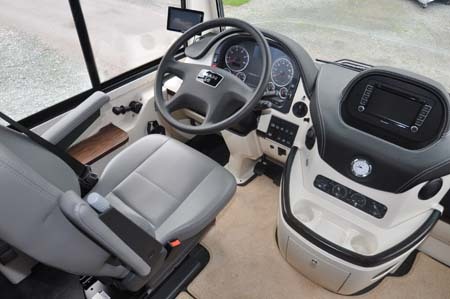 There’s no doubting the supreme comfort of the Charisma’s sleeping arrangements, either – twin singles at the back (which can be bridged to make a double) and a huge glide-down double over the cab area. The only real area of controversy could be the washroom. 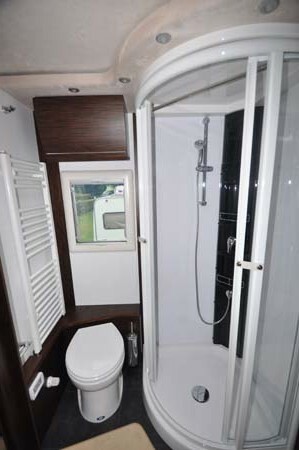 It has dividers to section it off, but the marine toilet is not as private as it could be, and it’s a slightly strange sensation walking past the kitchen and straight through the washroom to the main bedroom at the back. There’s no doubting the overall space in here, though, and – again – all the fixtures and fittings are of the highest order. What do you get at these prices? The very best, is the simple answer. You’ll recognise some of the features, for sure. The hob, fridge/freezer, Alde heating and hot water and more – although, again, do note this is somewhat more than the standard system. It offers zonal heating to the three main living areas, for instance, with complete underfloor heating in addition. 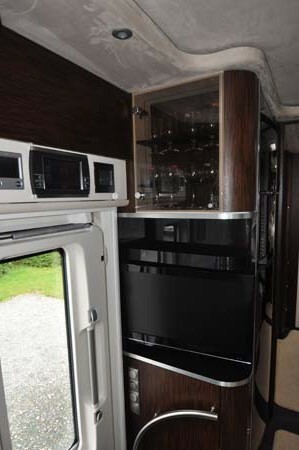 But, what pervades is the sheer quality of every aspect of this motorhome. Materials used really are of the highest order – Plexicor for the kitchen and washroom sink worktops, perfectly aligned locker doors, the Mastervolt electrics (no flat batteries, and no chance of tripping out a site’s supply) more storage than you’ll ever know what to do with (and that’s before you get to the rear garage). Stuff of dreams? Maybe. But, they can come true, sometimes. 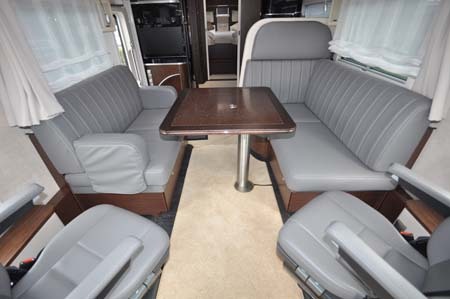 There’s more information on the Concorde Charisma range on the Southdowns Motorhomes website (www.southdownsmotorcaravans.co.uk) and to find out more about our low-cost premiums visit the motorhome insurance discounts page. We saw one of these on a campsite in France but the owners were still using the site’s very minimal facilities! Strange when the Charisma has just about everything! I’ve checked on Concorde’s website and it doesn’t show any right-hand drive options or layouts.